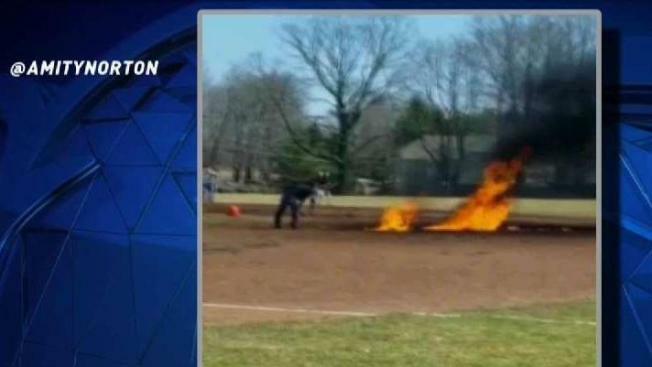 The town of Ridgefield said 24 gallons of gasoline were poured on the field at Governor Park in an attempt to "dry the field quicker." The town plans to excavate the infield, place dirt in a safe container and add fresh, clean soil to the field. A Ridgefield High School baseball game was delayed as a result of the incident. No one was injured and no one is in danger, the town said. The Town of Ridgefield said the field may be closed for the week for testing to be completed. It’s not clear how much the repairs will cost, but town officials said it can cost $50,000 or more.